Is the Pekingese Right For You? Pekingese dogs are royal in appearance and attitude. The Pekingese can make a great friend but they do require a fair amount of grooming time. Pekingese make good apartment dogs, and love to expend their energy on walks. Named for the ancient city of Peking (now Beijing), the Pekingese is sometimes referred to as the Chinese Lion Dog because of their boldness and dignity. These dogs trace their origin back to the early 18th century and were brought to England after the British invaded the Chinese Imperial Palace and managed to steal away a few of these treasured creatures. The Pekingese was recognized by the AKC in 1909. Earning the nickname ‘Chinese Lion Dog,’ the Pekingese has a mass of hair that resembles a mane. A compact dog with a stocky, muscular body, the Pekingese still maintains a slow, dignified gait. They have a broad nose with wide nostrils, a flat muzzle, and dark eyes. The Pekingese is a tough, brave, independent, and affectionate breed that make fantastic companions and are very loyal to their master. If overfed, the Pekingese will become overweight quickly. Take precaution that your Pekingese does not develop "small dog syndrome" by setting limitations and never wavering in your role as pack leader. 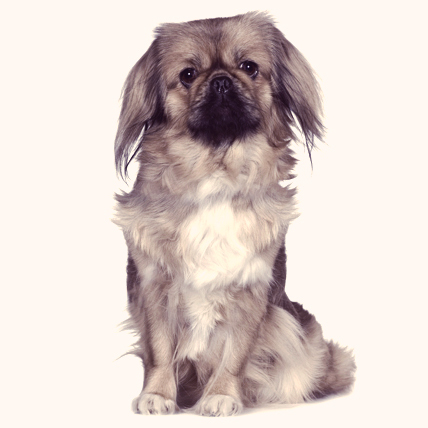 If properly socialized and trained, the Pekinese can become a wonderful watchdog, thanks to their powerful bark, or they can just be a wonderful lap dog. The Pekingese can come in a seemingly limitless array of colors and all coat colors are acceptable in show dogs and considered of equal merit.